The UK’s first operation to fit a single cochlear implant capable of giving sound in both ears takes place this Friday (27 August), thanks to the work of the South of England Cochlear Implant Centre (SOECIC), based at the University of Southampton. A cochlear implant is an electronic device that can help both adults and children who have a severe to profound hearing loss. It has two parts: an internal receiver/stimulator package and electrode array, and an external speech processor that looks like a hearing aid. The device uses small electrical currents to directly stimulate the hearing nerve, which then sends signals to the brain where they are interpreted as sound. 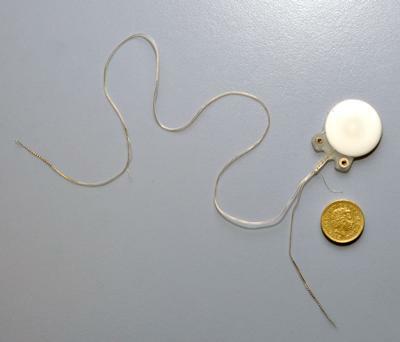 Although around 40 of these devices have been implanted in patients in Europe, this is the first of its kind in the UK. The operation will be carried out at Southampton General Hospital by Mike Pringle, Consultant Otolaryngologist based at Queen Alexandra Hospital in Portsmouth. Mike Pringle says: “This is different to other types of implant as it is one implant going into both ears. It’s not unusual for children to have two implants, one in each ear, but adults usually just have one. “This type of device has an internal receiver/stimulator with two wires; one will go directly into one inner ear and the other will go over the top of the head, under the scalp, to reach the other inner ear. There will be a microphone on each ear collecting sounds from both sides. “The advantage is that it allows adults to have bilateral hearing. Having two ears working makes it easier to hear in noisy backgrounds and also helps with localisation, or hearing where sounds are coming from. The recipient of the implant is a 44-year old woman from the Isle of Wight. She has been deaf all her life and has used hearing aids until now. Dr Helen Cullington, Clinical Scientist (Audiology) at the University of Southampton, adds: “Following the surgery she will need to wait for four to six weeks before the device is tuned and she can begin to have auditory rehabilitation to encourage her listening with the new sensation she will experience.